International Hobo is proud to announce the addition of a new member of their game design and dialogue scripting "family". Quantum Content, owned and operated by veteran of TV and Alternative Reality Gaming, Wendy Despain, is the fourth company to join the maverick consortium, which has continued to grow from strength to strength since its formation in 1999. The other three organisations are the core company, International Hobo Ltd (UK), Ernest Adams' Designer's Notebook, and Sanjit Daniel's Fantasy Labs developer, based in Mumbai, India, who developed the inventive platform-puzzle game Play with Fire. "We have been working with Wendy for some time," comments International Hobo founder and Managing Director Chris Bateman, "and it is a great pleasure to bring her under the brand umbrella, so to speak. We like to see our framework as a unique opportunity for talented individuals working in the creative medium of games to gain the strengths and advantages of a larger organisation while maintaining a high degree of autonomy." Wendy had this to say about becoming a member of International Hobo: "I'm excited to be joining such a respected group of game developers. I've admired their work, and I'm glad I can bring some additional writing and design skills to the table. I look forward to pushing the boundaries of interactive entertainment with this experienced and distinguished group in the future". Quantum Content supplies scriptwriting, producing and consulting services to major media companies in the US. It was established in 2003 and has contributed to interactive projects for television, books and videogames. At their VIP Luncheon at this year's Game Developers Conference in San Francisco, the International Game Developers Association (IGDA) honoured International Hobo's founder, Managing Director & Creative Overlord with their prestigious MVP Award, "for outstanding and immeasurable contributions to the IGDA and the betterment of the game development community." Chris arrived late to the luncheon, and had no idea he was to receive the award. He had just finished hurriedly eating his first course when IGDA Program Director Jason Della Rocca made the announcement, much to Chris' shock. 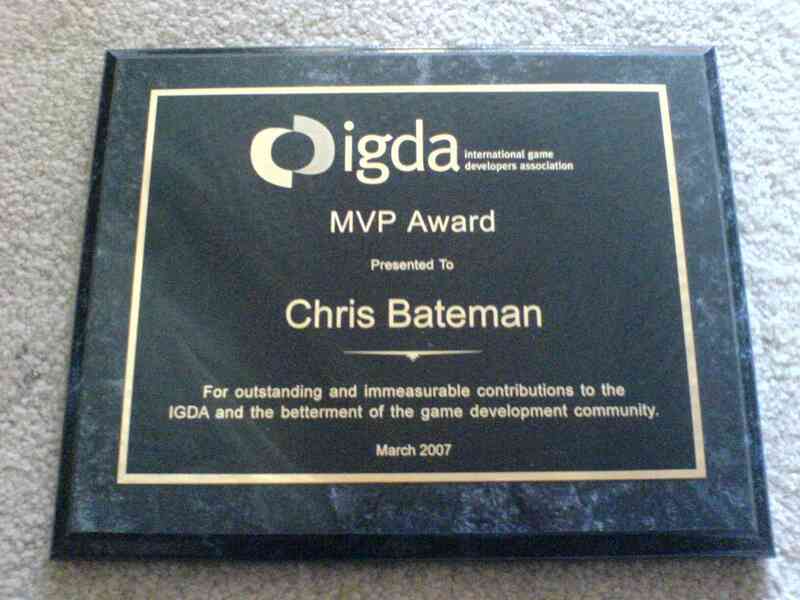 Jason explained that the award was in recognition for Chris' work establishing and running the IGDA's North West UK Chapter, and the Game Writers' Special Interest Group, for which he has served on the Executive Panel for five years. "It must have been a slow year," Chris quipped upon taking the podium, displaying a quintessentially British sense of self-deprecating humour. He also noted how ironic that he would be called to speak at the point in the show when he was both hung over and badly jet lagged and thus reduced to "an intellectual imbecile". However, he praised the contributions of the other members of the Game Writers' SIG and noted: "If Newton is famous for the phrase 'standing on the shoulders of giants', I like to think that I have been carried along by a crowd of enthusiastic and talented midgets." He accepted the award on behalf of the whole of the Game Writers' SIG.